Daniel….Pennsylvania Senate: New Quinnipiac University Survey confirms PPP Survey; Toomey ahead of Specter and Sestak…..
A new Quinnipiac University Survey in the Keystone State confirms the PPP Survey from earlier this week. Former U. S. Rep. Patrick J. 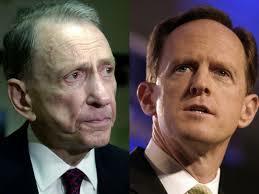 “Pat” Toomey (R-PA) HAS REGAINED the lead over Incumbent Senator Arlen Specter (D-PA) and U. S. Rep. Joseph A. “Joe” Sestak (D-PA). The Survey also finds Obama’s JA “Underwater” in the State. All the bad Polls coming this week for the Democrats are done after this DISASTROUS CRAP Health Care Reform Bill passed. Hey Daniel…I got that…I do suspect that this race will seesaw back and forth till the election…..I expect Ole’ Arlen to win though….. I agree that this Race will seesaw over the coming months. However I don’t agree with you that Specter will win in the end. I expect Corbett to have enough coattails to put Toomey over the Finish Line in the end. BTW, where is my PA Governor Post? Arlen has a a following in both parties…I expect him to pull it out…..
2010 is likely Specter’s LAST political campaign either way because some of the House members are dying for a promotion by 2016.